Pet Food: Processed to Death? by Jean Hofve DVM • September 19, 2016 • Comments Off on Pet Food: Processed to Death? Many thanks to Susan Thixton at TruthAboutPetFood.com for letting us reprint her excellent article here, which applies 100% to cat food as well as dog food. The multiple rounds of heat processing that pet food undergoes causes many deleterious changes that can harm our pets. And it’s worse than most people even imagine. How many times are Ingredients cooked in Kibble Pet Foods? Do you know the processing involved in the manufacturing of kibble pet food? How many times are the ingredients cooked? The answer might surprise you. Pet food kibble was invented in 1956 by Purina; that is Purina was the first to produce an extruded kibble pet food as most are made today. Prior to kibble, the greatest majority of pet food sold in the United States was canned pet food. But shortly after Purina’s introduction of Purina Dog Chow, (within two years), kibble became the leading style of dog food in the US. Statistics for 2013, U.S. dry dog food sales were $9.2 billion as compared to U.S. wet dog food sales $2.4 billion. No doubt about it, kibble pet foods are the most popular style of feeding pets, but are kibble pet foods the healthiest style of feeding pets? With this question, we are not going to consider quality of ingredients – only processing. 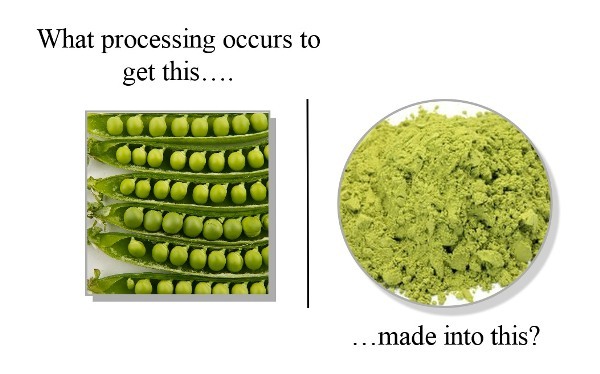 What processing is involved to make kibble? Quoted text below is from MadeHow.com. Ingredients are cooked or heated 3 times during the manufacture of kibble pet foods. There is more processing to consider; some ingredients are cooked or processed prior to arriving at the pet food plant such as rendered ingredients like beef meal and chicken meal. Meat meals are commonly used in kibble pet foods. Meat meals are made by finely grinding meats (and often bone), cooking the material, and separating the remaining moisture from the solids. The solids are dried into a powder like substance (above – meat meal). All of this processing occurs before ingredients arrive at the pet food plant (where it is cooked again in the pet food). To help kibble keep its shape after drying, multiple starches are included. One commonly used starch is pea protein (especially in grain free pet foods). As you can see in the image above, this ingredient is processed into a dry powder prior to its inclusion in the pet food manufacturing process (where it is processed again in the pet food). So…what is the total? How many times are pet food ingredients cooked during the process of kibble manufacturing? If you feed kibble, consider the processing involved to make it. Please add some real food to their diet each day (replace some kibble with real food). Added meat can be raw or lightly roasted, vegetables lightly cooked. Water Water Everywhere, but What’s a Cat to Drink?